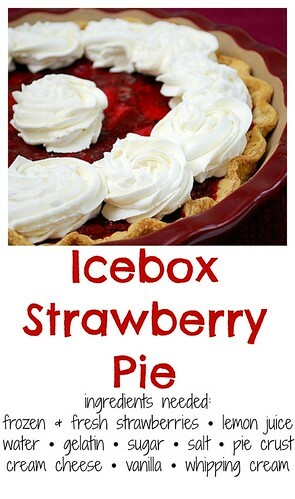 Article first published as Icebox Strawberry Pie on Blogcritics. 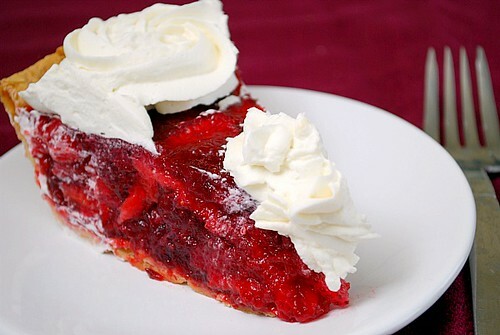 You may be surprised to know that this pie uses both frozen and fresh strawberries. The frozen strawberries are cooked on the stovetop down to almost a jam consistency. It's imperative that you start off with 2 pounds of frozen strawberries... otherwise the filling will not set up or slice well. After the berries are cooked down, gelatin is mixed in and allowed to set up briefly. Fresh sliced strawberries are folded in and then everything gets placed into a baked pie shell to completely set up in the fridge. Just before serving, top it off with the creamy whipped topping made with cream cheese. It's a great way to use those fresh berries, especially when in season! 2 pounds frozen strawberries *extremely important! COOK FROZEN BERRIES Cook frozen berries in large saucepan over medium-low heat until berries begin to release juice, about 3 minutes. Increase heat to medium-high and cook, stirring frequently, until thick and jamlike, about 25 minutes (mixture should measure 2 cups). ADD GELATIN Combine lemon juice, water, and gelatin in small bowl. Let stand until gelatin is softened and mixture has thickened, about 5 minutes. Stir gelatin mixture, sugar, and salt into cooked berry mixture and return to simmer, about 2 minutes. Transfer to bowl and cool to room temperature, about 30 minutes. MAKE TOPPING With electric mixer on medium speed, beat cream cheese, sugar, and vanilla until smooth, about 30 seconds. With mixer running, add cream and whip until stiff peaks form, about 2 minutes. 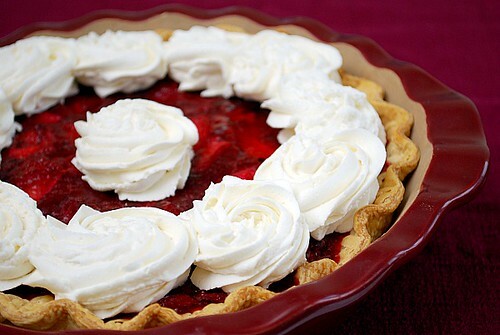 Serve pie with whipped cream topping. This looks amazing! I am drooling and can't wait to try this as local berries are at their prime in my neck of the woods! Too funny - my hubby also has an aversion to PB & eggplant (as well as a host of other things - onions, potatoes, who knows what else!). Fortunately, he LOVES strawberries and would definitely like this. Thanks for sharing the recipe! I find the whipped cream in the topping is too rich and I cut it with sour cream. I also add a little lemon zest to the topping. My preference though is to have it more jello-ee; something that Americas Test Kitchen tries to eliminate.